Doug, Wendy and Mustang Sally cruise the Virgin Islands. Follow along on their adventures meeting funky local characters and visiting hot spots and hidden treasures with links to our favorites websites and additional interesting information. 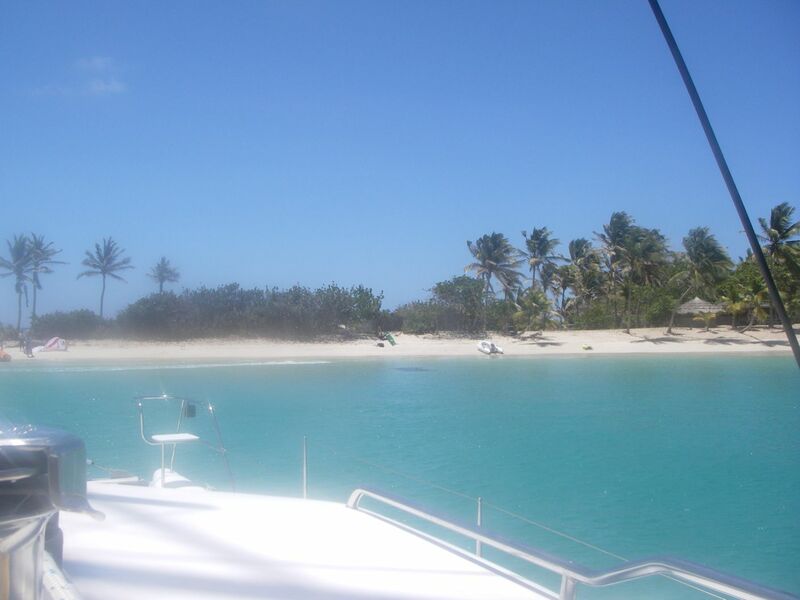 After a breezy, short sail from Canouan we arrived at Salt Whistle Bay, Mayreau. This was one of the prettiest anchorages we had seen as yet. Unfortunately, other boats thot the anchorage was nice as well, as the little bay was pretty full, but we managed to find a good spot. Salt Whistle Bay is a half moon shaped bay lined with palm trees around the white sandy beach. Behind the beach we could just barely make out thatch roofs that belonged to Salt Whistle Bay Club, a private resort that was not very busy as June is off season. A short path thru the towering palm trees brought us to the windward side of the island with a long beach that collects driftwood that wash ashore and is great for shelling. Mayreau does not have running water (similar to many of the smaller Caribbean islands) and so they collect rain water in large drums visible beside the house or in back. This also means that any sewage runs downhill in the gutters lining the streets headed for the ocean. The island only got electricity in 2005 and so those who can afford appliances are making good use of it. The main source of employment is tourism due to Salt Whistle Bay Club resort but this sector is growing as the locals are beginning to cater to the cruisers who show up. The locals also fish for their dinner and will sell their catch as well. The guide book had warned us against giving our garbage to any locals who come around in pinieros/pirogues to collect yachties garbage as they do not have any means of disposing the garbage and they will just dump it in the bush. We saw this in many places on the island. What a shame. We heard that the little village was worth seeing to so we started hiking up a very steep road to the other side of the island and we noticed a cemetery were all of the locals who died on the island were buried. We could see very clearly the families that could afford to bury their family member in a certain fashion or those who could not, and simply dug a shallow grave and covered the body with stones without a marker. There are no grave diggers or groundskeepers in the islands and so the families and their friends all help to dig the grave and build the tombstone or encasement. We walked on a little further and found a very simple but pretty Catholic church, the religious hub of the island, that had a spectacular view of the Tobago Cays, where we were going next. The locals live in very simple homes, and there were goats and islands dogs everywhere. I just happened to have a bagful of dog treats with me (this is where Doug rolls his eyes) and the island dogs enjoyed them, so did the goats (no surprise there as goats eat everything) but the birds were eating them as well. We came across a very colourful restaurant, like the guide book says the building is “much like an ongoing art form of construction” and the restaurant is a fave hangout for cruisers and locals alike. 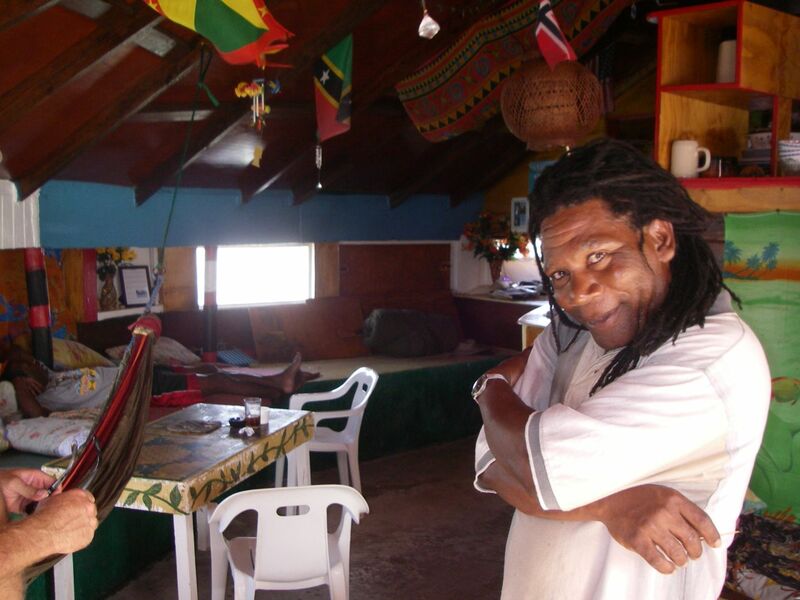 We thot “Righteous and the Youths” was a perfect place to grab a cold beer and hopefully shoot the breeze with the popular Rastafarian, “Robert the Righteous”, who owns the restaurant. Robert is known as welcoming, friendly and someone with whom you can have a serious discussion on just about any topic. He proved to be all of these things and we enjoyed meeting him very much and could easily see how he influences the local youths to stay out of trouble and make a good life for themselves. Each evening at Salt Whistle Bay “Walter the Bread Man” comes around in his colourful wooden piniero (pin-yer-o) to each boat taking orders for the next morning’s delivery of fresh baked baguettes which are delivered just in time for morning pots of hot coffee and the baguettes are warm enough that the butter still melts on each slice. Walter’s wife works hard very early every morning to fill the orders and put a little bit of money into the kitty at home. We gladly tried to help out. After our baguette, Rene on Gypsy Blues offered to show us how to crack coconuts. This was a great chance for Doug to try out his never before used machete. Should I be concerned? 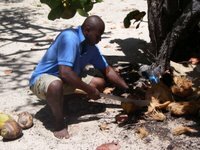 Rene, Cheryl, Doug & I all traipsed back thru the tall palm trees and started selecting our coconuts for cracking, that is, until the groundskeeper for the Salt Whistle Bay Club very sternly told us we were on private property and should not be there. In short order and after a little schmoozing, “Nicholas”, was showing us just how to crack the perfect coconut and sharing all kinds of great coconut recipes with us. 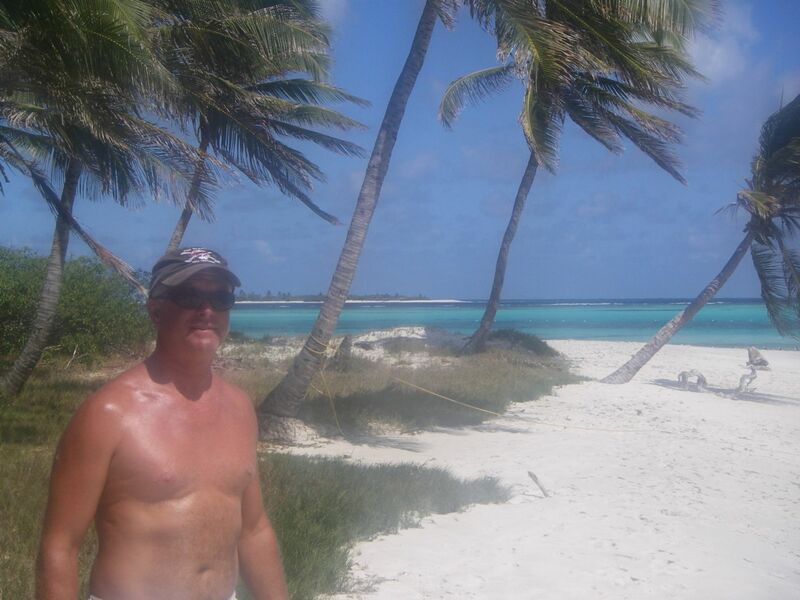 We also had a chance to enjoy an very good impromptu kite surfing show on the beach by some other cruisers before we lifted the anchor and headed to Tobago Cays which are only 3 miles away. The Tobago Cays are a small group of deserted islands protected by a large reef in the shape of a Horseshoe, hence called Horseshoe Reef. 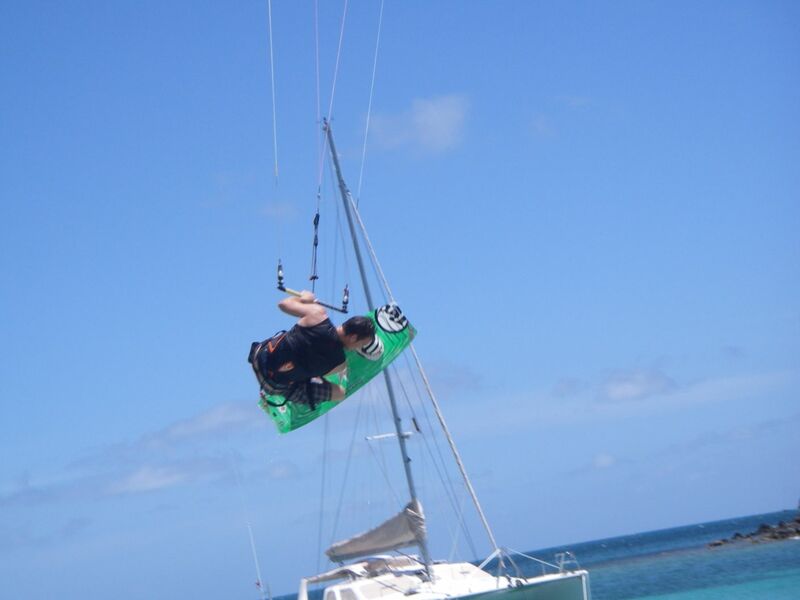 The islands are perfect for windsurfers, kite surfers, hobie cats, pretty much any wind propelled vessel as there are is very little wave action. The reef also protects against any large swells which make for comfortable anchoring, especially for mono hulls, but boats still receive a lovely breeze. On every small island there is a pretty white sand beach with palm trees. When you stick your head outside of your cabin hatch in the morning all there is to see is wide open ocean. The Cays also make for some pretty spectacular star watching at nite as there is no light pollution. One of our favourite things to do after dinner is lay up on the trampolines on the front of the cat and watch for falling stars, of which there are always a few. The Tobago Cays are a national park and hopefully will remain as they are now, which is undeveloped. It would be terrible shame to see these islands become resorts. The water is so clear and aquamarine here you can’t wait to jump in. The reef is mostly dead but it is still an incredible area to swim, snorkel and relax. Snorkeling for coral and all of the fish that live amongst the coral is not the best, but there are still lots of turtles and rays (both my personal faves). We enjoyed swimming with the turtles in a buoyed off swim area that the turtles just love. There were quite a few there and we got some great underwater pics. After spending a few leisurely days in the cays we reluctantly lifted “Bruce” up and set sail for Clifton, the capital of Union Island. 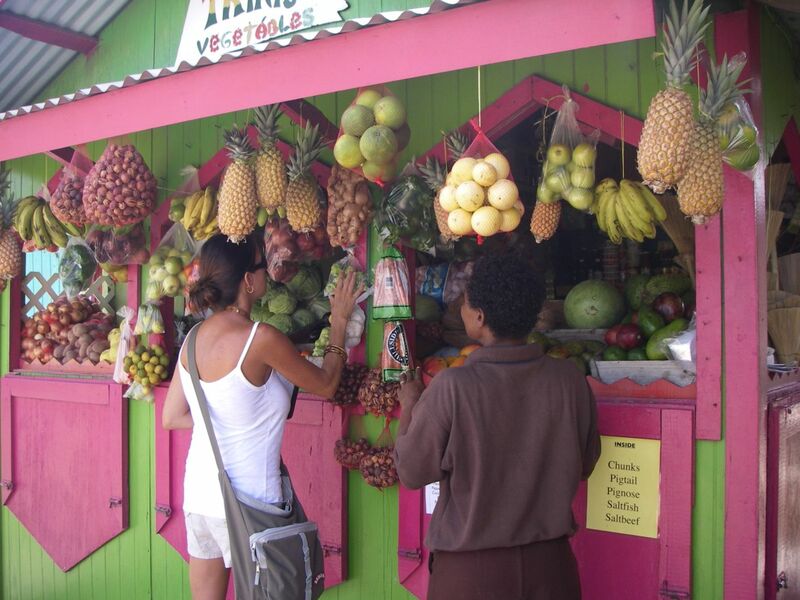 We entered Clifton Harbour, which is surrounded by another reef, to load up on fresh fruit and veggies as we heard this was the place to do this with the local ladies and their colourful stands all competing for your Eastern Caribbean dollar. The selection of produce was just as good as it had been in Bequia at the Rasta Market and the women were almost as aggressive so I did the same thing I did in the Rasta market. I bought a little bit from each vendor and that seemed to make everyone happy. We had noticed what was left of a large boat that was in small pieces on the shoreline in the harbor and we learned from the locals that it had been washed up on a reef and this was all that was left of her. All of the other cruisers had also seen the “boat” on the shore and everyone was picking thru the pile looking for boat parts and spare bits of hardware. Typical cruisers. LOL! Everyone is finding all of the little pieces that would cost a pretty penny at the marine stores and there is my Doug doing the same. He wants lifelines off the boat so that we can make some stainless steel locks for our kayaks, that way, no one can steal them off the deck of the cat. This was important as we would be in Venezuela soon where boat crime is pretty bad. One of the locals decided that Doug is “stealing” and should be hauled off to the police. All of the other cruisers are slinking away with their goodies while my guy might end up in a Caribbean jail….great….just great. After some heated discussion with numerous locals and lots of apologizing on Doug’s behalf, he dinghied back to the boat perturbed that he never got those lifelines and a little more perturbed that the other cruisers took off like kids caught in a candy store leaving him to hold the bag of candy. We were both happy that was all that happened. After that little bit of fun, we both noticed a very kewl island out in the middle of the reef just outside of Clifton Harbour with palm trees and we could see thru our binoculars a big sign that said “Happy Island”. That was just what the doctor ordered right then. 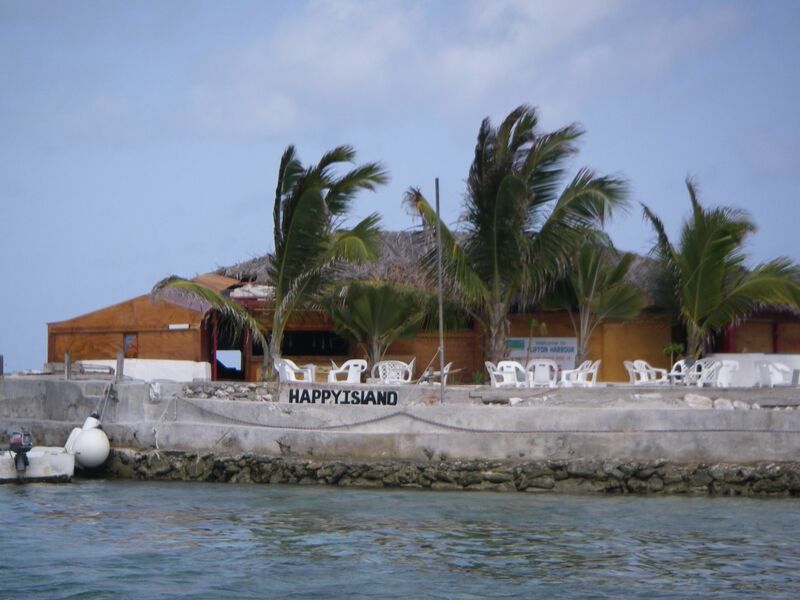 We dinghied on over for a little look see and were happy to discover a local Rasta named Janti is operating a bar and restaurant here on the island he created from conch shells, sand and palm trees. 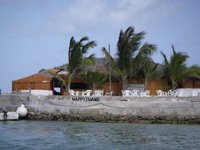 This is the perfect place to take your dinghy to, snorkel around the reef surrounding the bar and then enjoy sundowners. If you let Janti know in advance he will have lobster dinner ready for you too! 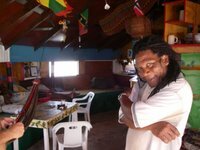 What a difference people can make in your life as we limed with Janti and enjoyed a few rum punches. It was hard to leave Happy Island and we can’t wait to get back there and lime with Janti again. 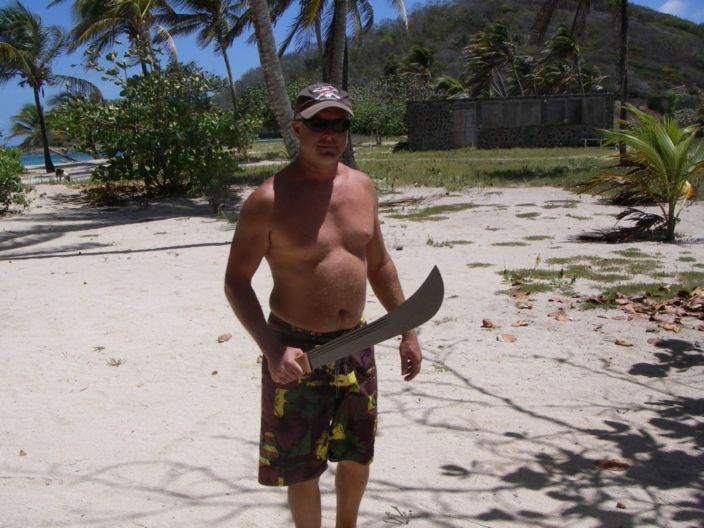 We took Bruce out of the water again and motor sailed to Chatham Bay were we planned on hangin’ out for a few days before making way to Tyrell Bay on Carriacou. Around the southwestern tip of Union to Chatham Bay we go. Chatham Bay is on the lee side of Union and is a very large protected anchorage surrounded by a lovely sand beach where no one lives except a few locals on the beach in open air huts. One of the local guys we met right away was Bobby, as he paddled out to the cat on his surf board, a really nice young local fellow. He offered to put together a beach BBQ for all of the yachts in the bay and if we needed anything else he made himself available to us. We decided to poke our heads in on the locals living on the beach and see if anything was happening with them. We met Bobby again and he introduced us to few of his friends. One of these fellows was named “Pleasure the Guitar Man”. We both thot this was quite funny and thot perhaps we should come up with similar names for ourselves. It turned out the Pleasure should really have been called “Wood Man the Carver” as he carved lovely images out of the local trees. One of them in particular caught my eye and we couldn’t help ask about it and its “unusualness”. Pleasure (we learned his real name is Darius) told us this was a carving of his grandfather who has now gone to meet his maker but has never been forgotten as for his virility and popularity with the ladies and as a result fathered many, many children all by different women. This gave Darius a great deal of pride having descended from such great stock.LOL! This unfortunately is how most of the local males think on the islands we have been to. They father many children by many different women who ensure their masculinity and then they go live on a beach somewhere and never see their kids, help to raise them or give any money….but I digress. 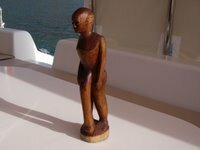 Doug and I both felt that this carving would be great conversational piece on Mustang Sally as well as a good representation of the local Caribbean male culture. We asked what the carving of his Grandfather might be called and we learned that it has two names. First being “Grandfather” which of course made a lot of sense and actually the second name also made a lot of sense once you gazed upon the carving…..”Tird Leg Man”. The locals had dropped the “H” in third and we in our juvenile minds thot it was quite comical. see pic. Anyway, now Tird Leg Man has a place of honour on MS. We hosted a potluck appetizer party on MS that same nite so that everyone could admire Tird Leg Man and there was a few smart quips smattered thru out the nite about our new acquisition. Tom and Sharon from “Sojourn”, Dave and Donna from “Magic”, Dave and Michelle from “Daniel’s Story” and last but not least, Rene and Cheryl from “Gypsy Blues” all attended the premiere gala event. The next morning we had plans to sail to Tyrell Bay, Carriacou which is actually part of Grenada, the most northerly island. Before we left, tho, Doug went on a dive with Dave the Diving Dude from Magic. Dave and his wife Donna have been diving for 30 years all over the world…..the Red Sea in the Med was their favourite place. Doug very enjoyed his dive with Dave who likes to poke at eels and other disgusting creatures but was mainly on the hunt for a really big grouper he had spotted the afternoon before but, alas, the big fat grouper failed to make an appearance and the boys came back empty handed. Once Doug was back on board we checked out of The Grenadines and headed for Carriacou where our friends on Meggie were hanging out.